Indonesia's retail sector is one of the most promising in Asia, on the back of its large population and growing middle class with higher purchasing power. Indonesia's retail sector remains one of the most promising in Asia, on the back of its large population and growing middle class with higher household purchasing power and increasingly modern spending habits. While in 2017 private consumption was affected by higher prices for food, electricity and fees for vehicle registration, in 2018 it is supported by lower credit cost, increasing employment and an expansion of social welfare. Retailers’ profit margins decreased in 2017, but are expected to remain stable in 2018. Last year some initiatives were taken to boost sales after the more subdued retail performance, e.g. “Indonesia’s Shopping Day” was held last August, organized by the Shopping Centers Tenants Association (Hippindo). In 2017 a number of retailers, both foreign and local, closed some or all of their stores in Indonesia as they were no longer able to sustain business amid weaker consumption and stronger competition. However, at the same time, other retailers have increased capital expenditure by opening new premises, especially to reach out to smaller cities and regions outside of Java that are less saturated. Those expansion plans piggyback on the government's undertaking for infrastructure and logistics development in more remote regions. 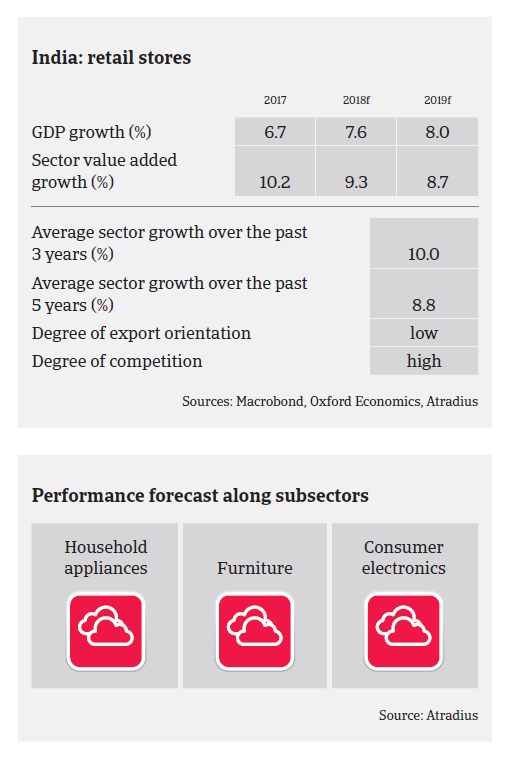 The medium-term outlook for the consumer durables retail sector remains positive amid structural reforms and increased spending on infrastructure by the current administration. Notably for the retail sector, the government has permitted up to 67% foreign ownership in shares of department stores with a sales floor area between 400 and 2,000 square meters, as long as they are located in a mall. Like in 2017, the average payment duration in the industry is 30-60 days. The number of protracted defaults remains rather low, and we expect non-payment and insolvencies to be stable in the coming months. The overall indebtedness of businesses in the sector is low, and banks are generally willing to lend. Our underwriting stance for the industry is generally open. However, we assess buyers more prudently if there is a lack of financial and other qualitative information, such as strong group backing. In 2017, Indonesian respondents reported an increased percentage of domestic and foreign overdue B2B invoices (domestic: 45.1% and foreign: 41.2%). The economic outlook remains positive with expected GDP growth rates of more than 5% in 2017 and 2018, and vulnerability to external shocks has declined.